Regulatory affairs chemistry, manufacturing and control operations are a critical component for the success development, approval, manufacturing, and marketing of consistently highly effective and safe therapies. As products continually become more complex in not only product design but in the compound and chemical makeup, CMC executives are challenged with obtaining the high levels of evidentiary support to showcase the product’s overall performance and quality. Building on conference knowledge share and success of this annual conference, the 2018 program will showcase industry experts within CMC operations, who as presenters will share experiences and knowledge that will be of great benefit to all attending delegates. 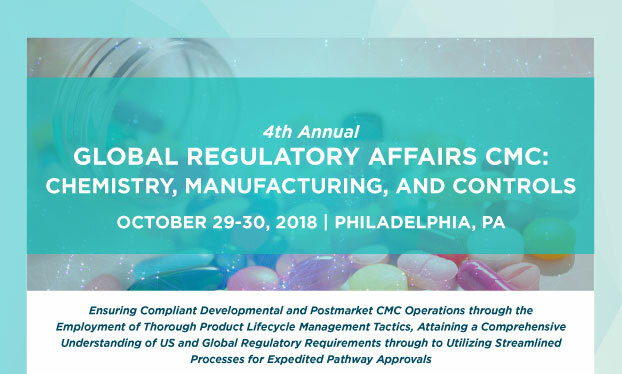 Industry leaders will address a range of topics from highlighting CMC data requirements and regulations from different global marketplaces, streamlined approaches to combination product CMC and best practices for conducting CMC operations for expedited pathway approvals. Medical Device corporations face a tremendous level of incoming data, representing feedback and complaints from stakeholders including patients, caregivers, healthcare professionals and hospitals, all of which must be treated with the utmost care and consideration in order to align with regulatory and safety reporting requirements. This data also provides insight into real-world utilization of products, and potential earlywarning signals for technologies and products which may require corrective actions, which, identified and resolved early-on can reduce potential damaging regulatory action. On a global scale, changes to regulatory oversight, policy and regulation surrounding reporting are also causing challenges for manufacturers who are eager to comply and continually align actions with regulatory requirements.